San Salvador, the capital of El Salvador, is the second largest city in Central America (after Guatemala City in Guatemala), home to an entire third of the El Salvador population. As a result, San Salvador contains affluent suburbs as well as slums, representing the discrepancy in the country's distribution of wealth. Still recovering in many ways from an extended history of violence, San Salvador can be sprawling, grimy and chaotic. But once compromising first impressions are set aside, many travelers will discover San Salvador's other side: friendly, globe-conscious, cultured -- even sophisticated. San Salvador is located at the foot of the San Salvador Volcano in El Salvador’s Valle de las Hamazas – the Valley of the Hammocks – named for its powerful seismic activity. Though the city of San Salvador was founded back in 1525, the majority of San Salvador's historic buildings have collapsed over the years due to earthquakes. San Salvador is one of the major transportation hubs of Central America; the capital city is spliced by the Pan-American Highway, and home to the largest and most modern Central America airport, El Salvador International. 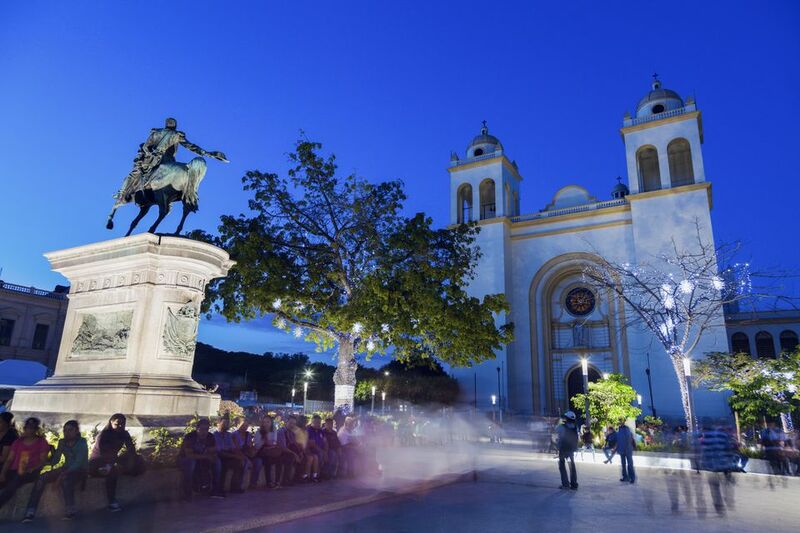 Nightlife in San Salvador: The Zona Rosa is the top destination for upscale San Salvador nightlife. Users recommend La Luna Casa y Arte, Senor Frog's, Stanza, Guadalajara Grill, and Club Code. Make sure to take a taxi to and from your hotel at night. San Salvador Museums & Historic Attractions: Among the best San Salvador museums are the David J Guzman National Museum of Anthropology, the Museo de la Palabra y la Imagen (the Word and the Image Museum), and the Museo de Arte MARTE. Any cultural trip through San Salvador must also include a series of San Salvador National sites: the National Theater, the National Palace, and the National Cathedral. Last but not least, the beautiful San Salvador Jardin Botánico La Laguna -- the La Laguna Botanical Gardens -- is a must-see for nature-lovers. As with most Central America destinations, San Salvador experiences two major seasons: wet and dry. San Salvador's wet season is in May to October, with the dry season occurring before and after. During Christmas, New Year's and Easter week or Semana Santa, San Salvador grows extremely busy, crowded and expensive, though the joyous throngs are a sight to behold. Getting to and around San Salvador is simple. Central America's largest airport, El Salvador International Airport or "Comalapa", is located right outside of San Salvador. The Pan American highway runs right through the city, connecting it directly to Managua, Nicaragua, and San Jose, Costa Rica in the south, and to the north from Guatemala City all the way through North America. For traveling overland between Central America countries, international bus lines Ticabus and Nicabus have terminals in San Salvador. For travelers on a budget, the public bus system in San Salvador is decent and is the cheapest way to get around San Salvador and to other El Salvador destinations. Taxis are everywhere; negotiate a rate before climbing in the cab. You may also choose to rent a car from a San Salvador rental car agency like Hertz or Budget. El Salvador is internationally notorious for its gang problems, and most of the country's gang activity is centered in San Salvador. Because of this, as well as the city's size and the disparity in its wealth, crime is a problem in San Salvador, especially in its poorer neighborhoods. When in San Salvador, use the same precautions you would in any Central American urban area: don't flaunt valuables or signs of wealth; keep money and important documents in a money belt or in your hotel safe; and don't walk alone at night -- take a licensed taxi. Read more about Central America safety. El Salvador has adopted the US dollar as its national currency. No exchanging necessary for American travelers. The super-modern Metrocentro Mall in San Salvador isn't just the largest shopping mall of the Metrocentro chain (which also owns shopping malls in Tegucigalpa, Guatemala City, and Managua, as well as others in El Salvador) but also the largest shopping mall in Central America.